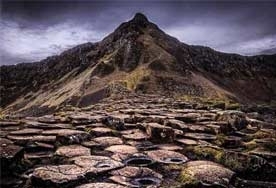 'Giant's Causeway Last Light' is an open edition photographic print by Alastair Stockman. The warmth of the sunset is captured in this image and is contrasted with, the rough sea, turbulent clouds and the hardness of the stones of the causeway. Alastair has captured the heart of the Giant's Causeway in these stunning Causeway prints.